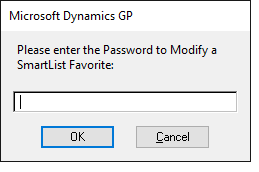 With year-end procedures in full gear, Microsoft has released Dynamics GP 2016 R2, the latest in the Dynamics GP series. This year, they’ve done something a little bit different by combining the year-end update for GP 2016 with the R2 service pack, meaning that if you’re using GP 2016, they are one and the same download. This is convenient, as it helps minimize the level of effort needed to make sure the system stays current into the new year. I think most users who are familiar with Smartlist have probably been there at one point or another. You have a Smartlist which you frequently use to check up on the amounts in the system, and you’ve painstakingly crafted this Smartlist by adding just the columns you need, removing the extraneous, until it has become a thing of beauty. Then, Joe from down the hall has to go in and check something, and the next thing you know, the Smartlist has been mutilated beyond recognition. With this new feature, you can set the security for a given Smartlist so that it is now protected from anyone who doesn’t have the password. When a user attempts to modify an existing Favorite, they will receive a warning to the effect that they are going to change the current Favorite. Anyone who does not have the password will not be able to change the Smartlist. The users can now go directly to the person in question to find out why this is happening. As a pro-tip, if you receive this error and your username is the one being referenced, make sure you have all other transaction/batch entry windows closed. Credit cards have always been a bit tricky to handle in ERP software. If you use credit cards in payables management in GP, you know that creating a credit card payment also creates an invoice to the credit card vendor. This is to account for the fact that you owe the credit card company the money paid to the original vendor. Before GP 2016 R2, there was no visible link between these invoices, which made it difficult to tic-and-tie transactions without reviewing potentially several transactions. 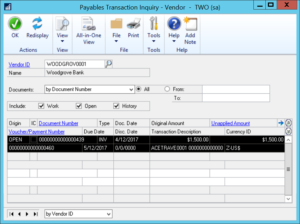 With GP 2016 R2, when you create a credit card payment, the invoice is still automatically created, but it now contains a reference to the original invoice in the Transaction Description field, visible from any of the Payables Inquiry windows. Also, this also changes the way that the GL Reconcile tool handles these invoices. Where a credit card invoice would previously appear under Unmatched Transactions, in this version you will see the offsetting transactions from the original invoice and related credit card payment. This will likely save an untold number of headaches from spending late nights trying to trace unmatched transactions on the GL Reconcile report that are simply credit card transactions. Learn more about the newest features of Dynamics GP 2016 by watching our on-demand webinar here, or visit our recorded webinar page to view lots of great webinars hosted by Informed Systems, Inc. Contact us today for more information or to discuss how Dynamics GP can help your business! ← What Do the Latest Technology Innovations in Microsoft Dynamics GP 2016 Provide?